Are You Sensitive To Loud Sounds? As you may know, most hearing loss is caused from exposure to noise. 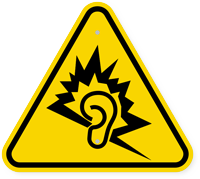 Approximately, 26,000,000 Americans between the ages of 20-69 have high-frequency hearing loss due to exposure to loud noises at work or in liesure activities. Approximately 80% of your speech is made of these "similar sounding consonants", having a hearing loss in this same high range area is the underlying cause of your communication problems. As you already know, being unable to hear the higher frequency letters in speech make it difficult to understand softer voices, such as womens' and childrens' voices. Noise exposure first damages the tiny nerve cells whose job it is to detect these higher, softer more important speech sounds, leaving you only able to hear the lower-pitched background noises. Most people are surprised to learn most hearing losses are complicated by what is medically called, "RECRUITMENT". Recruitment happens when a small increase in loudness, feels like a HUGE increase in volume! Recruitment comes with a hearing loss caused from constant or loud noise exposure and happens more often with women. 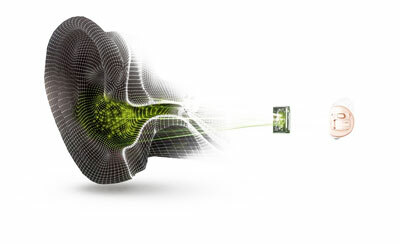 The good news is today's advanced digital hearing aid technology can take care of this "loudness sensitivity" issue better than ever before. Personal recruitment challenges from being over-sensitivity to loud sounds, is exactly why many people don't wear their hearing aids . . . simply because their hearing aids are not properly fit to these specific personal hearing and sensitivity needs. With the latest automatic hearing aid technology, background noise is no longer quite the obstacle it used to be. The most important factor is not to wait too long before getting your hearing loss properly fit. Follow me? You see, understanding speech is a memory function and if you have a hearing loss, your ears are working like "filters" blocking out information, in the form of speech sounds. Ignored long enough, your brain can literally "forget" how to tell the differences between all these similar letter sounds. When we test you for this it's called a Word Recognition Test (WRT). The higher your WRT score the better your results with hearing aids. We can help rehabilitate word recognition skills only to a point. Don't be left in the lonely, dark silence of confusion because you denied your symptoms. This need not be! When the brain permanently loses its ability to seperate similar sounds, even the best hearing aid technology won't restore your word recognition skills. This is why early detection is vital and also why we at The Great American Hearing Aid Company llc, recommend using our, "Aural Rehabiltation Training" (ART). See "A.R.T." The ultimate goal achieved by properly correcting your hearing loss is to open the familiar pathway of speech, back to your brain. Typically, 80% of hearing losses are a type of loss called "Nerve Loss" or medically speaking, a "sensori-neural hearing loss". Nerve loss happens in the inner most part of your ear called the cochlea. Your cochlea contains tens of thousands of microscopic, hair-like nerve endings. Normally, these nerve endings transmit electrical signals into virtual radio waves, which feed the brain information and stimulate your Cental Nervous System (CNS). Because your brain is pure intelligence, it adapts very well, at first. This is why most people put off getting their hearing corrected for so long. You don't realize how many sounds you're missing, because your brain fills in the missing sounds by "guessing" . . . yet as time moves on, your "guessing" becomes harder as your ears continue to filter the softer consonants out more frequently. FACT: The average person will put off getting hearing aids 7 years after they discover they need help. The old adage that "If you don't use it, you'll lose it" is literally the case. Slowly, your hearing loss effects memory and your brain forgets how to listen. It is a medical fact that hearing loss puts stress on your body systems, contributing to other health concerns i.e., Alzheimers, high blood pressure, depression and more. See "Sound Health". Easy listening is a gift most of us take for granted. As your hearing fades, listening becomes less of a pleasure and more of a challenge.This is obvious in the case of a profound or severe hearing loss, however, over time even a moderate and often a mild hearing loss can have a damaging effect on your quality of life both physically and emotionally. Do you know anyone who used to be the life of the party, but now they actually avoid social events? Loneliness often accompanies hearing loss because misunderstanding conversations, missing punchlines and asking people to repeat themselves can be embarassing. Sometimes hearing loss will cause a person to become suspicious and untrusting, simply because they imagine people are talking or laughing about them. It's sad, but true. Does this ring a bell? Do you know someone who avoids group situations more than before? Truth is, good hearing is part of good healthcare. Having full awareness of the sounds of life around you keeps you connected to people. Better hearing supports a healthy memory, nurtures lasting relationships and helps protect your independence in a fast paced world. Learn How Sound Is A Nutrient For Your Nervous System! This "Sound Health" approach connects us to the highest possible quality of life. The idea of holistically helping you by supporting your natural interconnectedness with your environment is nothing new. "Sound Health" brings together both ancient wisdom and new science to maximize your well-being from the inside out. You may be suprised to discover how powerful your own "Sound Health" connection is, as you will see, it's as natural as listening to soothing music or waking to the sweet sound of a loved one's voice. Let's start from the beginning, from conception . . . When you are being formed in your mother's womb, your ears are one of the first "primal" organs to develop at only 18 weeks old. Your ears are literally energy "transducers", which means, they naturally change one form of energy into a higher energy. For example, the sound energy in the air around you (acoustic energy) is captured by your outer ear, like a catcher's mitt, and amplified into your ear canal. When this acoustic energy hits your ear drum it is "transformed" into mechanical energy as your ear drum acts literally as a drum, moving rapidly in a back and forth motion. Further on, attached to your eardrum, inside your middle ear, are the smallest and hardest bones in your body, called the hammer, anvil and stirrup. Because sound speeds up going through a denser material, these bones boost the mechanical sound signal in your ear. These tiny bones act as a bridge or linkage to conduct what you hear into the third or inner ear. Your inner ear is contains the Cochlea. The Cochlea is about the size of a pea and shaped in a spiral. Inside this spiral organ is a dense fluid. This is where the sound you hear speeds up again, because sound travels faster in water. This sound energy is transformed from mechanical into hydraulic energy, creating powerful sound waves, which move the microscopic nerve endings aligning your cochlea. In turn, these nerve endings trigger a chemical/electrical signal, which sends radio waves up through your 8th cranial nerve into the auditory cortex of your brain. This is where you recognize all the frequencies as your brain sorts them into recognized sounds of music, speech or noise. This amazing process also played a vital role in your development in the womb by providing electrical stimulation, which was necessary for your Central Nervous System (CNS), to develop. Imagine, every beat of your mother's heart was transformed into an electric pulse, which provided "sound as a nutrient" source for all your nerves and ultimately, the development of your biggest organ . . . your skin. This is why you feel "goose bumps" when you hear a loved one's voice or hear a song that touches your heart. Helen Keller was once asked if she could have her vision or have her hearing restored, which one would she choose. She pointed out she would choose her hearing over her sight, simply because eys connect us to things, but hearing connects us to others through a deeper relationship, sharing our thoughts and feelings. When you discover the bigger picture, your hearing is even more important than you may have first thought, would you agree?